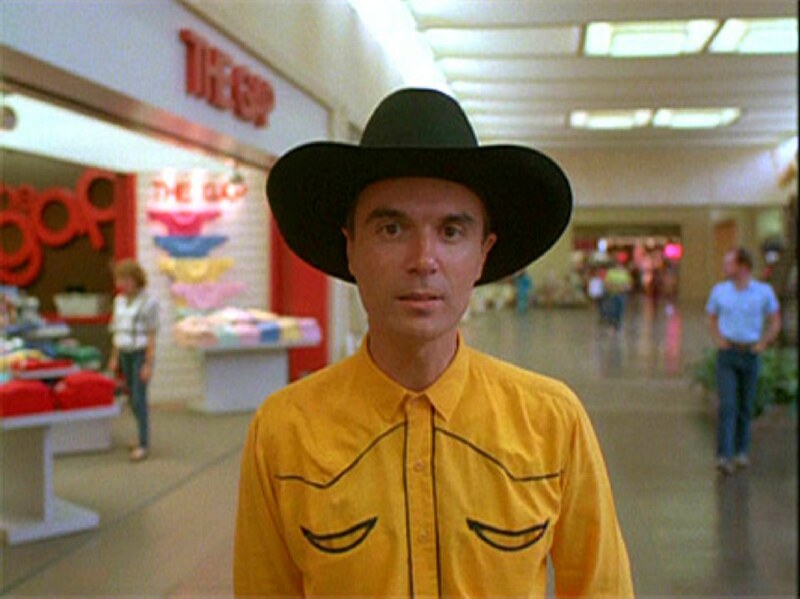 Tomorrow Night, Alamo Drafthouse Screens The 1986 Talking Heads Film Shot at NorthPark Mall. Every single day here on Central Track we highlight various things our readers can do in and around Dallas. But, sometimes, a particularly interesting event can be lost in the shuffle. Through this And Another Thing feature, we hope to give these events their due diligence by means of a little extra push. This Wednesday, as part of its recurring AIR Time series, Alamo Drafthouse's Richardson location (we have to specify these things now) is screening little-known, Dallas-shot David Byrne film, True Stories. But the film's especially cool around these parts because of its local ties. Oh, sure, Dallas is referred to as the fictional town of Virgil, Texas, in the movie — but, make no mistake, this movie is steeped in Dallas lore. Let's start with the script. That thing — which was based on a scrapbook full of tabloid newspaper clippings Byrne had been collecting on tour — was co-written by Kimball High School and SMU alum/noted character actor Stephen Tobolowsky along with his girlfriend and fellow SMU alum Beth Henley, although most of the script was eventually rewritten entirely by Byrne himself. Major plot points of Tobolowsky's, like the fact that the characters are prepping for Texas' sesquicentennial, were however left intact. As the DMN's Robert Wilonksy once pointed out, Byrne didn't originally intend to film the thing in Texas, but he eventually changed his mind. And that's exactly how Byrne and Co. went about making this one, filming much of the film in Dallas and its surrounding suburbs, including major portions at NorthPark and other portions at Mesquite's Big Town Mall (RIP). McKinney's town square and some nondescript Irving businesses were also utilized, among others. Other notable sequences include a parade that features members of the Sunset High School marching band, and a portion inspired by Dallas-based parody religion, the Church of the SubGenius. Speaking of the Arcadia, the Talking Heads song “Puzzlin' Evidence” was recorded for the film's soundtrack by the theater's Omega Audio Remote Facility. Additionally, soundtrack tunes “Hey Now,” “Radio Head,” “People Like Us,” and “City of Dreams” were recorded at Sunnyvale's Studio Southwest by Jimmy Wallace. Which brings us to the aspect of tomorrow's Alamo screening that really begged for it to be highlighted here: Stratoblasters guitarist and guitar show pioneer Jimmy Wallace will be on hand for this screening to tell stories about recording music for the film with Talking Heads and field audience questions about the loads of other big name rockers he's plied his craft with. Alamo's page recommends at least one person ask about the time he auditioned for Ozzy Osbourne but was rejected because of the length of his hair. Considering that his son James, who works as Alamo DFW's creative manager and programmer, probably wrote that call-out, we'll assume the story is pretty solid. Really: We can't wait to hear about this guy's wild, wild life.